Like all roofing systems, however, TPO does have some cons. Most of its shortcomings revolve around the fact that it is still so new. It doesn’t have the time-tested, reliable reputation that some other roofing systems can flaunt. 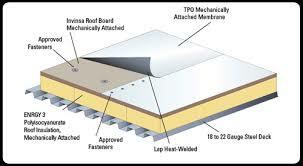 Also, remember that the strength of any roof (TPO especially) depends greatly on the quality of installation. If you choose a reliable roofing contractor and take care of your roof with yearly maintenance checks, you shouldn’t have any problems with a TPO roofing system. Looking to replace or repair your commercial roof with a TPO system? If you’re interested in learning more about TPO roofing systems and you live in the St. Louis Missouri area, give 800 New Look, The Hail Storm Pros a call at [company_phone] or scroll down to fill out our contact form and we will get right back to you. We are anxiously awaiting the opportunity to serve you.